This post is brought to you by American Heritage. All opinions are our own. Looking for a great gift idea for that history lover with a sweet tooth in your life? We have something super special for you today! You know American Heritage Chocolate, right? They make amazing chocolates from a recipe that dates back to 1750, and only with ingredients you could find in the 18th century. Pretty neat, right? Well, American Heritage Chocolate and National Geographic teamed up to bring sweet history lovers an amazing book: Great Moments in Chocolate History. Here’s the great news: one of YOU will win a copy of this book, along with some tasty treats! What is your favorite recipe? What fun facts and trivia about chocolate history would you love to know more about? Tell us in the comments! Great Moments in Chocolate History is a beautiful 208-page book that is part history, part cookbook. The story begins in the 1500s, in the Aztec empire, from where all great chocolate history originated! You’ll get a history lesson about Columbus’ arrival in the “New World” and his “discovery” of the cacao bean, then continue the journey as chocolate spread from the New World to the Old and back again! During your journey to the present day, you’ll discover when the chocolate Easter egg first hatched, how milk got into your cocoa, and the role technology played on the world’s favorite sweet treat. You’ll also find fun quotes about chocolate interspersed throughout the book. Once we reach present day, Great Moments in Chocolate History switches over to a recipe collection, with 23 delicious chocolate concoctions. Learn how to make Chocolate Macarons, the Easiest Chocolate Layer Cake (with chocolate frosting), and even Chocolate Peanut Empanadas! The history lessons don’t end when the cookbook begins: each recipe gives you a brief origination story. You’ll also get tips for more successful execution. 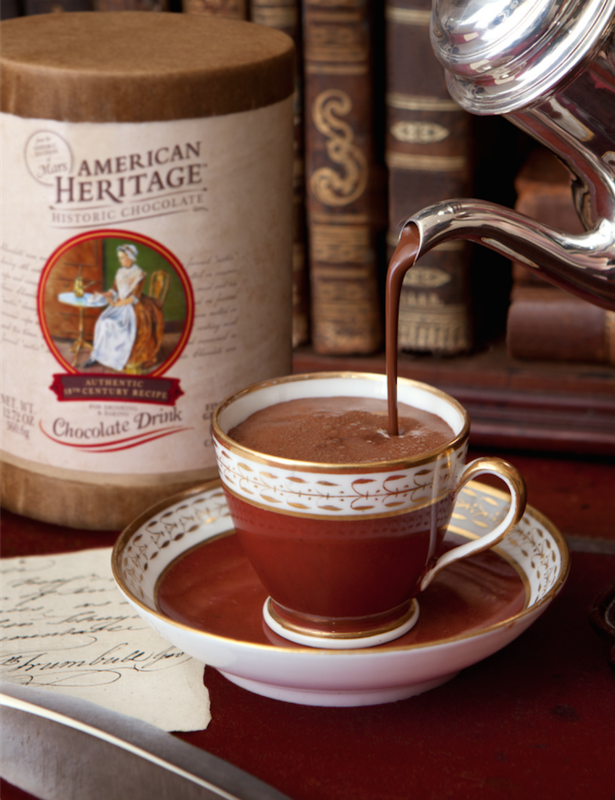 Finish up with a fantastic recipe for American Heritage Hot Chocolate! This is such an excellent gift idea for anyone who loves history, chocolate or both. Since chocolate is a special treat for us during the holidays, I like to make sure I’m serving the tastiest recipes possible. After all, we don’t eat chocolate every day! American Heritage Chocolate is so unique in both their historical recipes and their mission. Did you know that profits from their sales benefit their historical mission and go towards education? Their chocolate is also Kosher certified, made without dairy, wheat, peanuts, and tree nuts. Enter below for your chance to win! Giveaway is open to US residents age 18+ and ends on December 9th. I love chocolate chess pie! Need a little chocolate everyday! Anything chocolate is a win in my book! This book looks so interesting!! I love books like this! Fingers crossed!! My favorite chocolate recipe is for chocolate banana bread! I have a recipe for chocolate peanut butter bars that are amazing! My favorite chocolate recipe is for Chocolate Chip Pie! My favorite chocolate recipe is homemade chocolate fudge. My favorite chocolate recipe is my Grandmother’s Swedish Chocolate Balls. My grandchildren love to make them with me. My mom makes the most amazing chocolate pie! And that reminds me…. I need to call and get the recipe from her! My favorite would be Hot Thick Cocoa Drink. My favorite chocolate recipe is double chocolate chip cookies! So yummy ! But all in all i just love chocolate and i am very addicted ! My favorite chocolate recipe is buckeyes! I really love flourless chocolate cake (with ganache, if possible)! We make great chocolate covered cookies with chickpea flour. I absolutely love a Double Chocolate Fudge Brownies recipe my mom used to make! My favorite chocolate recipe is my milk chocolate fudge recipe! It is so delicious, everyone raves about it!! I never bring home any left overseas because everyone eats all of it! I have a great recipe for chocolate fudge that I really love. But pretty much anything chocolate is good by me! I love making homemade peanut butter cup bars! Yum! This looks so fun. Chocolate and education – my two favorite things! ?? One of my favorite chocolate recipes is chocolate or brownie cheesecake. One of my many—many!–chocolate favorites is Texas Sheet Cake. favorite is chocolate banana bread. I love Mexican hot chocolate – sweet and chocolaty and spicy! My favorite chocolate recipe is Chocolate Mousse! You had me at Chocolate! As I don’t drink coffee, I live for Hot Chocolate in the Winter, it gets pretty bitter and cold here! My favorite chocolate recipe? Always brownies. The chewy sort. And cream cheese and walnut brownies.. OH man. Just love them. My grandmother’s Divinity Fudge is my favorite chunk o’ chocolate – but it will knock you into a sugar coma in 5 seconds flat! I love how you can learn through this gift as well. I think my boyfriend would really enjoy this under the tree. This sounds like a fun giveaway! I love chocolate, especially Chocolate Covered Strawberries! Chocolate pretzel bark for the holidays is one of my favorites… and you can never go wrong with a steaming mug of cocoa on a winter’s day. I like a rich chocolate cake with chocolate frosting. Chocolate Peanut empanadas??? That would be crazy good. What a great resource. I love some of those delicacies. Wow, that hot chocolate looks do decadent! Perfect for chilly nights. Well, I don’t mind looking at chocolate all day long. YUM! What an awesome way to give a gift. This would be a great gift for any chocolate lover. I love trying new recipes. My Sister would love it. I LOVE chocolate, especially hot chocolate! I love anything chocolate.Especially fudge! You really can’t go wrong with something like this for Christmas. Some of the best gifts I have gotten on Christmas and Mother’s Day have been cookbooks like this that include a story. Plus this one is about chocolate! My favorite chocolate recipe is my family’s Chocolate Balls recipe – a holiday tradition. Yum! I’m pro chocolate anything, and all of this looks good. That hot cocoa looks very inviting! I would to try this for myself! I love me some chocolate! That hot chocolate looks really good!! I love anything with chocolate this time of year, but I am so into all the barks now! Yum. This is so cool. I’d love to learn more about chocolate while eating chocolate! I need some new recipes too. I super want that for Christmas! I love chocolate. This would be a great gift idea for anyone that loves chocolate! My Grandmother’s 12 layer chocolate cake was always the best. I know a few chocoholics that would love this book. That Hot chocolate picture makes me want that SO bad and I am not a huge chocolate person. Now I need chocolate! Thanks so much for sharing this. It’s very interesting. This time of year I love homemade hot cocoa! I love ultimate chocolate cookie recipe. Thanks for the chance to enter. My grandmother has a recipe for chocolate covered potato chips that is to die for!